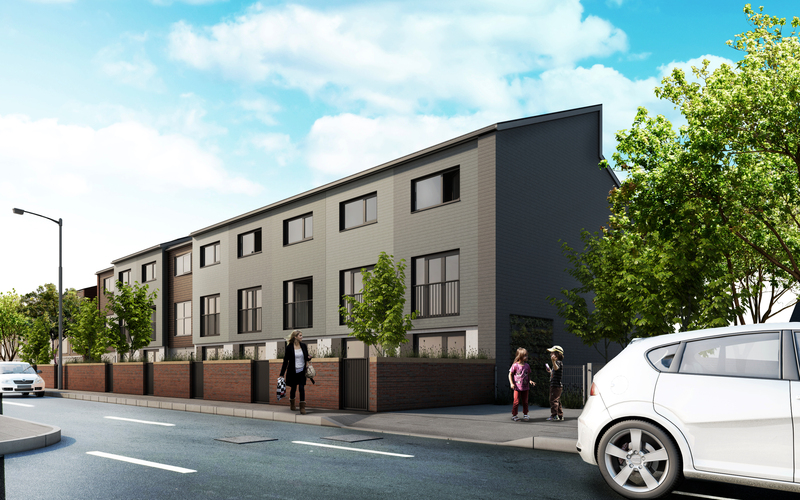 In Spring 2017 URBED worked with Keepmoat Regeneration (Engie) on a ‘runner up’ bid for the first EnergieSprong pilot project in the UK, for Nottingham City Homes. EnergieSprong is a Dutch mechanism for deep, whole house retrofit, in which the capital costs are paid for through savings in future energy bills and maintenance costs. This is possible because the improvements are joined-up and significant – with net zero energy a key design target. This is calculated over a whole year, with energy imports being cancelled out with energy exports from generation on PVs. There is also a focus on off-site construction, to enable work to take place quickly and disruption for residents to be minimised. Our proposal took a fabric first approach, making significant improvements to the insulation of walls, windows, roofs and floors, working with the Beattie Passive system. We were keen to tackle the ‘performance gap’ by paying careful attention to air-tightness, thermal bridging and thermal bypass. 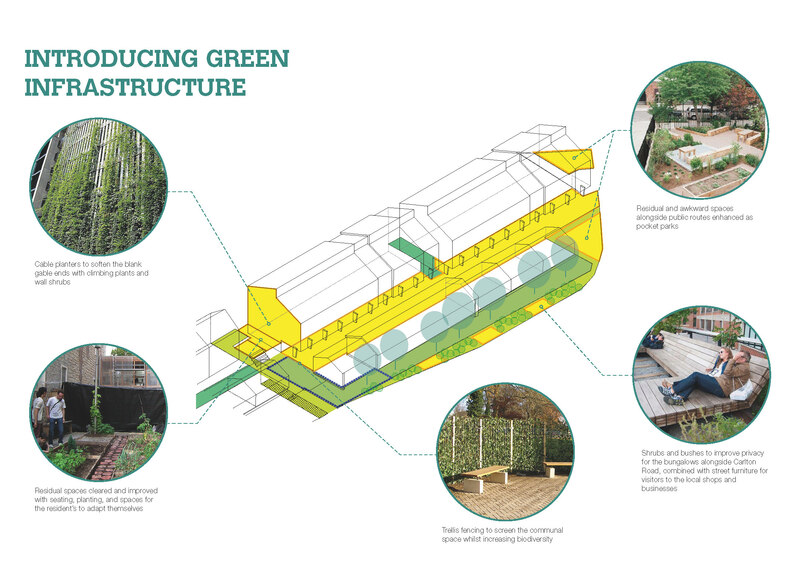 This was an interesting challenge with some large thermal bridges in the supporting structure, and the need to allow for ‘pepper-potting’ of un-treated privately-owned properties. LEDA developed a mechanical and electrical strategy for the air-tight and well-insulated homes, that included efficient services and ventilation, allowing us to meet the net zero energy target. We worked with Carbon Coop, using Open Energy Monitors, to develop a monitoring strategy and outline householder dashboard – essential for actual energy use to be tracked and the householders to understand it. 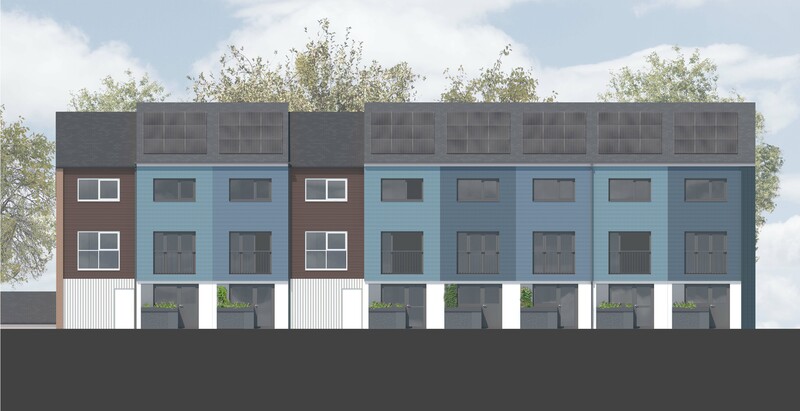 The client brief was not simply focused on the energy use of the buildings, but saw the project as an opportunity to improve the overall image of the surrounding area and help kick-start its regeneration. We looked to dramatically alter the appearance of the properties, through new cladding, windows and roofing. 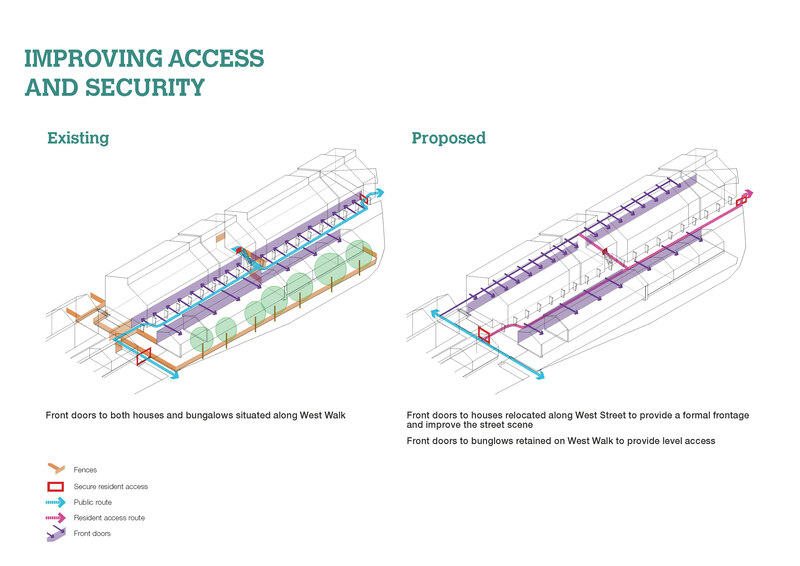 We also suggested improvements to the surrounding public realm, reorganising and rationalising existing problematic access routes to provide better security for residents, whilst providing more and better community green space. We believe this approach could be taken in many areas of the UK – tackling energy, climate and fuel poverty issues, whilst also making improvements to the quality of life in our towns and cities.